Performance optimizing hybrid OpenFlow controller describes the growing split in the SDN controller market between edge controllers using virtual switches to deliver network virtualization (e.g. VMware NSX, Nuage Networks, Juniper Contrail, etc.) and fabric controllers that optimize performance of the physical network. The article provides an example using InMon's sFlow-RT controller to detect and mark large "elephant" flows so that they don't interfere with latency sensitive small "mice" flows. 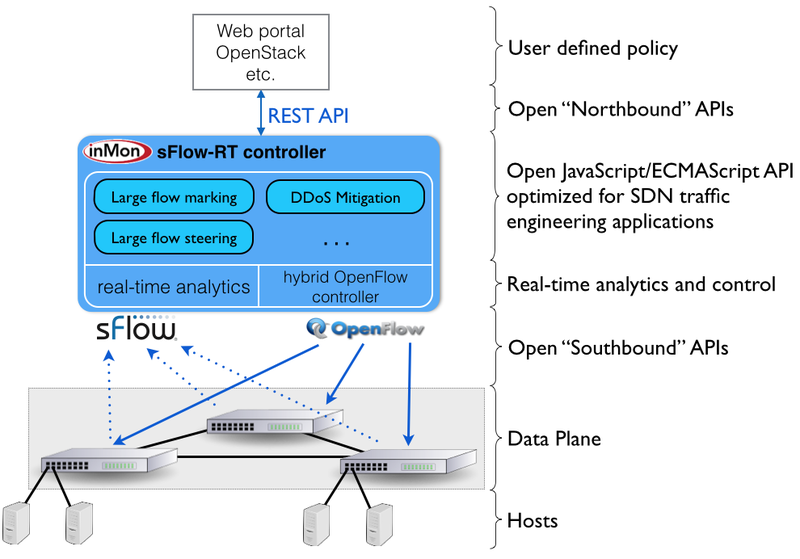 This article describes an additional example, using the sFlow-RT controller to implement the ONS 2014 SDN Idol winning distributed denial of service (DDoS) mitigation solution - Real-time SDN Analytics for DDoS mitigation. Figure 1 shows how service providers are ideally positioned to mitigate large flood attacks directed at their customers. The mitigation solution involves an SDN controller that rapidly detects and filters out attack traffic and protects the customer's Internet access. The setFlow filter specifies egress flows since the goal is to filter flows as converge on customer facing egress ports. The OpenFlow rule generated in setEventHandler matches the destination address and source port associated with the DDoS attack and includes an idleTimeout of 20 seconds and a hardTimeout of 3600 seconds. This means that OpenFlow rules are automatically removed by the switch when the flow becomes idle without any further intervention from the controller. If the attack is still in progress when the hardTimeout expires and the rule is removed, the attack will be immediately be detected by the controller and a new rule will be installed. The chart at the top right of the screen capture shows attack traffic mixed with normal traffic arriving at the edge switch. The switch sends a continuous stream of measurements to the sFlow-RT controller running the DDoS mitigation application. 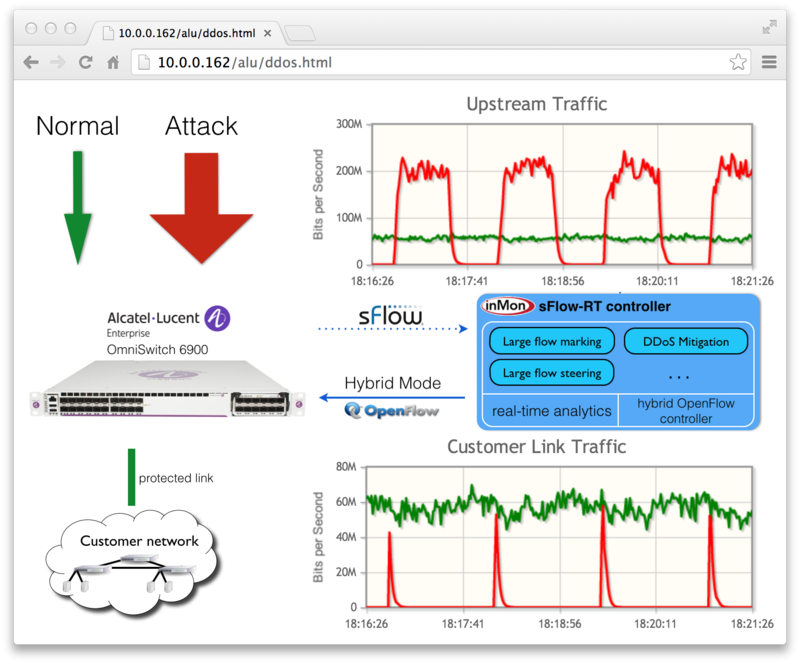 When an attack is detected, an OpenFlow rule is pushed to the switch to block the traffic. The chart at the bottom right trends traffic on the protected customer link, showing that normal traffic is left untouched, but attack traffic is immediately detected and removed from the link. Note: While this demonstration only used a single switch, the solution easily scales to hundreds of switches and thousands of edge ports. Great post! I am currently trying to recreate this experiment. I have sflow-rt up and running with the custom options (ddos.js and openflowcontroller start) as well as mininet (running the default 2 host topology with remote controller). I see feedback in the terminal that is running sflow and I know that the sflow-rt controller and mininet are talking to each other as I get a successful pingall. Overall, I think it's working but I can't tell for sure. I see that you have visualized your traffic with graphs and I was wondering if there was a way to do that same thing in sflow-rt web interface. (I tried to go to http://localhost:8008/metric/ALL/udp_target/html and unfortunately I see nothing) . I really appreciate the help and above all for the interesting article. Have a great week! Thanks for your post. I'm incredibly new to all of this and I realized that I wasn't setting any configuration for the mininet's openvswitch (i.e. "sudo ovs-vsctl -- --id=@sflow create sflow agent=eth0 target=\"127.0.0.1:6343\" sampling=10 polling=20 -- -- set bridge s1 sflow=@sflow" which was extracted from one of the other blog posts). I'll give this and your suggestions a shot when I get home. So it appears that ddos mitigation flow is getting pushed to the switch but I do not see any drop in the graph. It just continues to show the attack traffic as normal. Any thoughts on what I am missing? Thanks again Peter for the incredibly quick replies! Open vSwitch samples packets before filtering, so you see the discarded packets. If you add the following filter to your setFlow function, filter:'outputifindex!=discard', then you should be able to see the flow being dropped. Great everything works now as expected. Thanks a lot! I'm not sure why this error pops up. Am I missing something..? I would appreciate if I can get a help regarding this. You need to be running as root to open port 53. I really appreciate any help you can provide. Thanks! The message indicates that there is another OpenFlow controller running. You need to disable the controller so that sFlow-RT can open the OpenFlow port and receive OpenFlow connections. You can ignore the warning. It looks like you have successfully connected Mininet to the sFlow-RT controller. Sorry Peter but I forgot to mention that pingall is unsuccessful. Any ideas?